The program established in 2007, is targeted at delivering eye care services to the people of Sumba and building the capacity of the local and regional health staff to provide effective eye care for the community in Nusa Tenggara Timur. The province of Sumba is one of three main islands in Nusa Tenggara Timur (Eastern Indonesia). Sumba has a very limited capacity to access general surgery, let alone any specialist surgery. For more information and to download the full PDF article of the Bali Journal Of Opthomology use the above link. 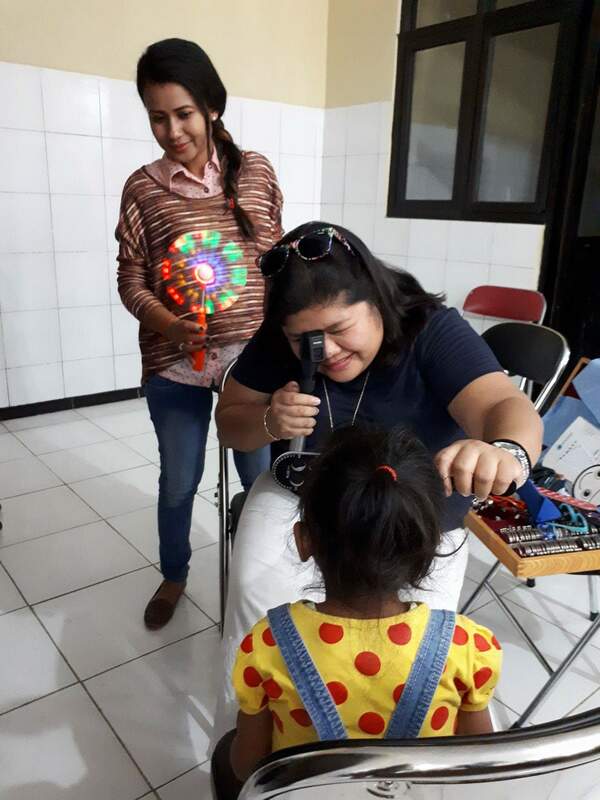 The Sumba Eye Program (SEP) is an outreach clinical eye service that delivers specialist eye services to the population in Sumba, Nusa Tenggara Timur, and training support for Indonesian eye health personnel. We report the baseline clinical findings from one visit to West Sumba, provide an overview of the methodology of our program and present initial progress towards establishing a sustainable local eye care service. Data was collected for patients presenting for examination during a five-day clinic from 10-14 June 2013. Demographic information, presenting and best corrected distance and near visual acuity and refractive correction were recorded. As part of management, corrective spectacles and therapeutics were prescribed and cataract procedures were performed. 765 patients between the ages of 2 and 97 yearswere assessed by optometrists. The most prevalent eye condition diagnosed was uncorrected refractive error, with 692 patients (90%) managed with refractive correction. 96 (12%) were referred for ophthalmology consultation, of which 87 underwent surgery, predominantly for cataract extraction and intra-ocular lens insertion. The Sumba Eye Program is contributing to the reduction of avoidable vision loss in the West Sumba population, however, ongoing training and recruitment of national health workers is essential tofurther build the capacity of the local service and assist with sustaining the outreach eye program, with the eventual goal of local provision of care at all levels. 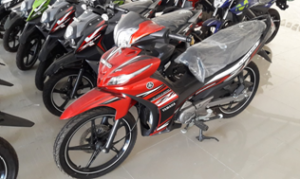 This laser will not only treat post cataract surgery issues, but will treat those with glaucoma , where the use of drops to lower pressure is very problematical in rural Sumba. Funding has come mostly through generous grants by Kew and Glenferrie Rotary Clubs and significant private donations . On this recent trip to Sumba the SEP team was able to meet with doctors from Bali Udayana University Ophthalmology Department. The main purpose of this visit was to introduce them to the work of the SEP team with the intention of having future collaboration with both them and University of Hasanuddin, hopefully enabling them all to help the people of Sumba and NTT . Training and upskilling of existing ECN’s was the most important objective of this trip. Optometrist Rowena Beckenham joined the SEP team on her first visit to Sumba and enjoyed this fulfilling experience. Elsiana (Elsi) also joined the SEP team as an Eyecare Nurse. The purchase of a new motorbike for Elsi was made possible from private donations and funding from “Optometry Giving Sight” and “Rotary” . 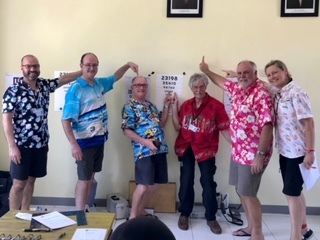 The Sumba team photo May 2018 and the silly shirt day team photos. Optometrist Liz Vidor joined the SEP team on this visit. 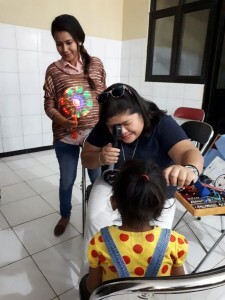 Dr. Adelina Poli from UNHAS in Sulawesi checking the eyes of a young Sumbanese child on our recent trip to Sumba- this collaboration with the Indonesian professionals is pivotal to the succes of the SEP. 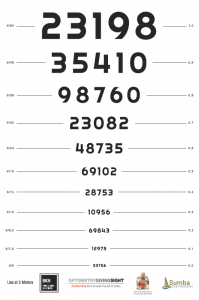 In Anakalang in Central Sumba,1103 people had their vision screened , 1101 spectacles were dispensed and 126 surgical procedures were done , mostly on people with very advanced (blind) cataracts. First week of April 2016 saw the SEP Team head to Sumba for mentoring and teaching camp. Janine Hobson and Chris Katapodis (Optometrists) headed to Sumba and provided lectures and one on one teaching to Nefry,Sani and the Nurses from the Sumba Foundation. 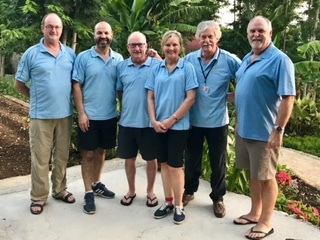 Mark Ellis, Peter Stewart and Peter Lewis detoured to Sulawesi – a large island north of Bali – to lecture and provide refraction training to the Ophthalmology residents at the Uni of Hasanuddin. They were warmly received and gathered great support for the future of the SEP . The aim of the Program is to help the Indonesian people sustain and expand primary eye care throughout NTT and beyond. 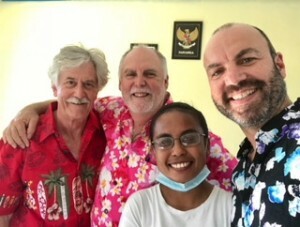 Dr Mark Ellis and his wife Janet then flew to Jakarta , joining Daliah Moss (RACS) to meet with many influential people in the Indonesian Health area and from all accounts the meetings were hugely successful. It is hoped from these meetings that the SEP can grow and help even more people in Sumba and NTT . The “two Peters” flew to Sumba to join Chris and Janine for several days of mentoring and screening. They were proud and excited to see how much Nefry and Sani had progressed in their eye care skills. More great friendships and understandings developed with the Ophthalmologists and Ophthalmology Trainees from Hasanuddin University in Sulawesi. Every Team member learnt new skills and improved on their existing techniques from the many challenges presented to us. To our Eye Care Nurse Nefry , what a wonderful job you do for us and your people. Sunny, Ma’a (Eye Care Nurses in Training) , Steppan , Miranda , Franky our long standing Interpreters and friends a big thankyou from the Team. 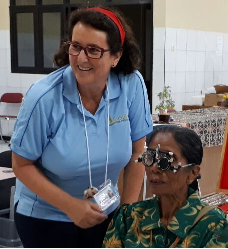 During the Teaching/screening week in Sumba the Team screened 405 people for vision problems, dispensed 276 specs, mostly to poor villagers with no access to any Eyecare and we detected 25 people with very advanced cataract (legally blind or much worse) or pterygia. An enormous amount of “one on one teaching” refracting and pathology with Nefry and Atti assisted by Steppan was possible. It was brilliant to see the Nurses achieve “light bulb ” moments when they mastered technique.